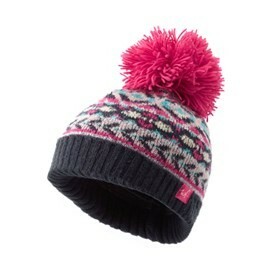 Choose the Aluna girls fair isle knitted hat for days out in the chillier air this season. They'll enjoy a warm, cosy hat that's not only practical but pretty too with a fancy jacquard pattern throughout and a bright, fluffy pom pom to the top. This knitted hat is made from a clever fabric composition, to ensure it's non-itchy, and we've even added a small amount of stretch so she'll be more than happy to wear it all day long. With Weird Fish branding throughout, your little one will be able to show she's a Weird Fish fan just like you! Keeps me so warm & looks fab with matching snood.